The Lebanese media is strangely of one mind: Saudi Arabia has supplanted Syria as kingmaker in Lebanon. Beirut’s pro-Saudi lawmaker Tammam Salam -- eldest son of the late six-time Prime Minister Saeb Salam, who was Riyadh’s pointman in Lebanon throughout his decades-long political life – is set to head a new Lebanese government. “Tammam Salam is premier-designate… by Saudi fiat” is how Ms Hiyam Qusaybati headlines her front-page lead for Beirut’s al-Akhbar daily, which speaks for Syrian President Bashar al-Assad and Hezbollah. Salam has already won endorsement of his nomination from the pro-Saudi March 14 alliance headed by former Premier Saad Hariri and from most members of the pro-Syrian and Hezbollah-led March 8 coalition. President Michel Sleiman is thus expected to conclude his weekend consultations by asking him to form a new government. Lebanon watchers agree the facilitator of Saudi Arabia’s comeback to center stage in Lebanon and of Tammam Salam’s nomination for prime minister is none other than Walid Jumblatt, the one and only eminence grise in Lebanese politics. Today’s print and electronic media are replete with Junblatt’s disclosures -- about Salam’s nomination and Saudi Arabia’s role -- in his interview with LBC TV anchorman Marcel Ghanem overnight. I chose Mr. Tammam Salam, nominated him and contacted him. He hails from an historic, moderate family and I hope everyone will positively receive him. I don't want to say (March 14 leader) Saad Hariri was dismayed when I proposed Salam, but his response was lukewarm. Hezbollah had the same reaction when I contacted them. Hariri's choice for prime minister was former Internal Security Forces chief Maj. Gen. Ashraf Rifi. But I told Hariri that Rifi is a confrontational candidate (to the March 8 alliance). And when Hezbollah asked me if I had a candidate other than Salam, I said no -- because he hails from a moderate family and he never said a bad word about the Resistance. During (PSP legislator) Wael Abu-Faour's second visit to Saudi Arabia, we rejected several names that were proposed, including Ashraf Rifi. Yesterday, during my telephone conversation with Hariri, he insisted on Ashraf Rifi but I rejected the name. I rejected the nominee despite his absolute competence. Even Wael rejected Rifi during his talks with (Saudi Intelligence Chief) Prince Bandar because we want a consensual candidate. I'm still a centrist and when I allowed myself to name Tammam Salam, I named a historically centrist political dynasty. And I won’t endorse or participate in any one-sided government. I will only give my vote of confidence to a government inclusive of all parties. Members of a national unity cabinet, not me, will thus decide the ministerial Policy Statement. I call for managing our differences inside the cabinet until the end of the Syrian crisis. My words were clear during my meeting with Prince Bandar that whatever the outcome of the Syrian revolution let no one think of any negative move against Hezbollah. Dialogue with Hezbollah is inevitable. I won’t accept to condemn the party and I don't approve of Obama's description (of Hezbollah as a terrorist organization). In the heart of Saudi Arabia, I said we want dialogue with Hezbollah in Lebanon and I call on Hariri to engage in dialogue, organize the differences and implement the policy of “dissociating” from the Syria crisis. I hope Salam will follow suit. 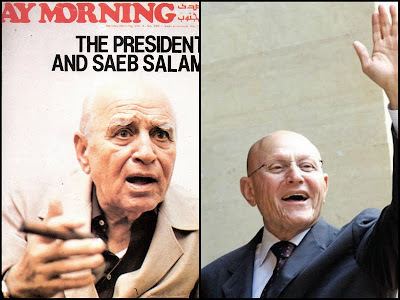 Saeb Salam, Tammam’s father, went into exile in Geneva in 1985 after surviving two assassination attempts. He had angered the Syrian regime of Hafez Assad with conciliatory stands he had taken at peace conferences held at Geneva and Lausanne the year before, and he did not feel safe to return to Lebanon until 1994. Five years earlier, he told my weekly magazine, Monday Morning, in an exclusive interview (see cover photo above) that his nominee for the Lebanese presidency was Raymond Edde. Edde was already living in self-exile in Paris after three Syrian attempts on his life in 1976. Walid Jumblatt’s father, Kamal Jumblatt, was assassinated near a Syrian army checkpoint in March 1977. Rafik Hariri, Saad’s father, was killed when a ton of TNT targeted his motorcade on Beirut’s shoreline. In its first two reports, the UN International Independent Investigation Commission (UNIIIC) indicated the Syrian government might be linked to the assassination.